Icey-Tek 1100 quart cube box in color code 02 - white shown with Icey-Tek 25 quart cube box also in white. 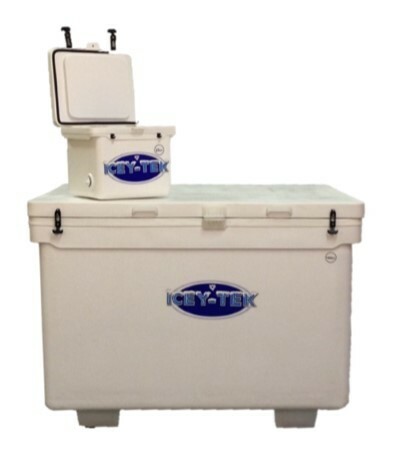 The 1100 quart cooler is Icey-Tek's largest cooler weighing in at approximately 175 pounds empty. It is designed for heavy duty commercial use and has integrated bottom runners to permit forklift handling and ease of movement. Icey-Tek's 1100 quart coolers are manufactured from commercial grade quality components and materials for ultimate performance and consist of a 100% grade A polyethylene on all exterior surfaces and a non-staining, non-odor absorbing, impact resistant polyethylene food grade internal liner. Superior ice retention is achieved by utilizing a premium medium density polyurethane foam insulation injected under pressure within all wall cavities and the lid. The rotomolding manufacturing process provides uniform wall thickness and coloring throughout the product. Four heavy duty, extra large, self stopping lid hinges are both welded and screwed for maximum strength and protected with a internal rope stop that prevents the lid from being pushed back too far. Dual neoprene gasketing ensures a tight seal between the lid and cooler body.